Fifty years ago, in 1965, both baseball and America experienced memorably tumultuous years. It was the summer of Juan Marichal and Martin Luther King, of Selma and Sandy Koufax, of Willie Mays and Malcolm X. It was the year the polite demands of the Civil Rights Movement morphed into bloody confrontation in Los Angeles. 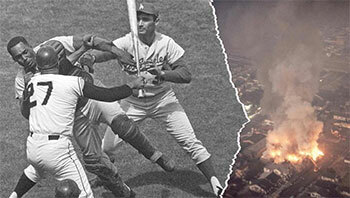 It was the year that baseball's most heated rivalry exploded in a frenzy of violence. It was the year that a mild-mannered southpaw became an icon to an entire religion, and it was the year that a young redheaded announcer uttered the most memorable nine innings of broadcasting magic in the game's history.